Ben's school moved closer to our house., now it's only a bit over a mile away. This week I walked to pick him up in the afternoon and we've really enjoyed the walk back together. Today on my way to school it started to rain on me, I turned around and headed back to the house but 2 blocks away it stopped and the skies were blue again and the sun was out. 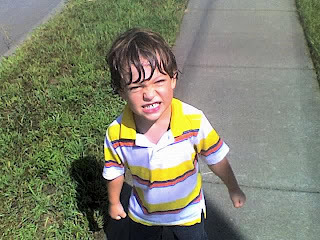 I turned back towards school and continued the walk and dried off b/f I arrived, but on our way home pete calls to tell me the worse is headed straight for us. WE GOT SOAKED! for most of a mile it rained and rained HARD. We had fun stomping thru the puddles and singing in the rain. 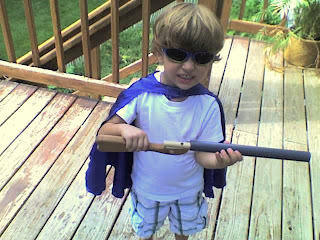 Ben with his super cape, pop-gun, and shades. He was defending the deck from the bad guys! I think Ben has plenty of dinos these days. 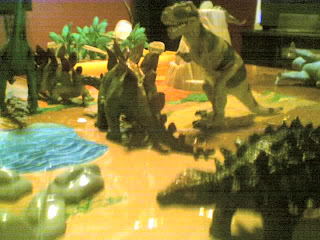 HE LOVES THEM.. but I think he has 3 t-rexes, 2 steggies, and a million more. He wants me to play with him, but i get frustrated. Doesn't matter who I am, his T-Rex always wins.